Ultramer hydrophilic coating provides superior lubricity and increased biocompatibility. Maintains lubricity by absorbing mucosal fluid, providing easy insertion and removal with enhanced patient protection. For long-term use. Designed especially for permanent urinary incontinence. Hydrogel-coated latex provides superior lubricity by absorbing the mucosal fluid. Large, smooth drain eyes for maximum drainage. Provides easy insertion and removal with enhanced patient protection. 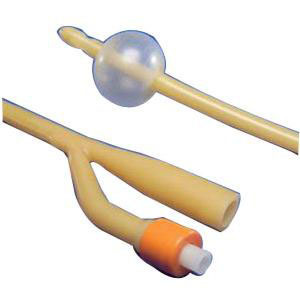 li>Bespak spring-loaded valve ensures proper inflation/deflation of Foley catheter balloon.